Today I want to talk about private eye, Caramba! It was written by Adam Frost and directed by Hanelle Culpepper. It was her first Castle episode she directed. And it was a great debut. Like I said last week in my YouTube review, I love that the Castle writers finally went there with Rick becoming a PI, and last week and this week proof they made the right move. It seems like the chemistry between Rick & Kate is as good as ever. This might have partially to do with the events at the beginning of the season, but I mostly feel it has to do with the fact that they aren't officially allowed to work cases together anymore. Richard ruined a great moment himself. When he and Beckett were in bed, Beckett got all excited, until she found out Richard was asking for a different favor she thought she was asking for. A kind of sad moment between Caskett followed after a very sweet moment: Beckett asked Castle to walk her to the crime scene. 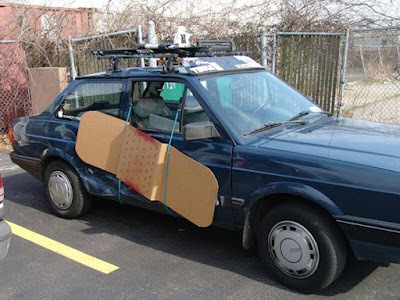 But when they got there, Rick wasn't allowed to pass the crime scene tape anymore. Rick was the one who solved the murder nonetheless, after solving the case he got hired for first (finding a purse). He had some good learning moments in becoming a real gumshoe. But of course he got in trouble too, as he was being held at knife point. Someone he didn't get into trouble using Ryan's name and badge number to track a limousine. Lanie was absent for another week, but Perlmutter was there to replace her again. And I really love Perlmutter. He made sure to note that he was happy Richard Castle wasn't anywhere on the crime scene and even gave Ryan a sort of lecture about his Castle like theories and his real science work. But running a found fingerprint was of course something Perlmutter couldn't do, as it was something for the lesser minds of Ryan and Espo. Ryan was great again with his attempts to see the case from a different point, the thing Rick normally brings to the table. Richard Castle Jr is really getting the hang of it. 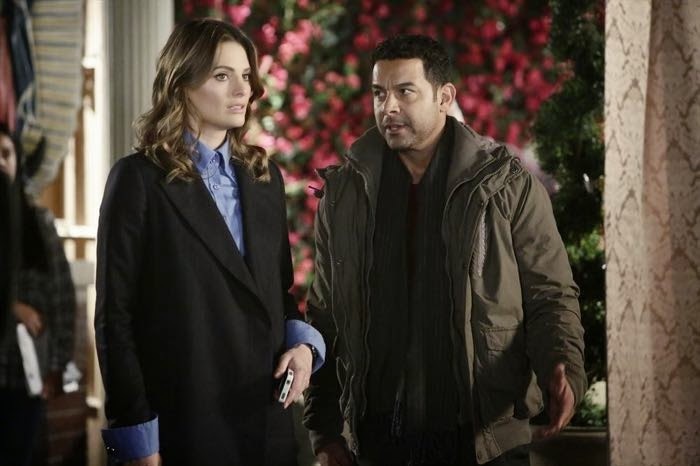 Esposito was quite bad in his attempts to fool Beckett that his grandma likes the telenovelas. He clearly was fangirling on the set and when he was meeting the cast members. At the end his "big" secret came out when he asked Sophia Del Cordova for an autograph for "his grandmother" who was called Javier Esposito. The moment between Beckett and Martha at the beginning of the episode was quite sweet. Martha calling Beckettt darling, like she really is part of the family and they were discussing the new direction that the guy they love most took with his PI adventure. A quite awesome trick of Castle needs a mention too. While he was being bored in his office, he impressively managed to throw his pencils in the ceiling. A trick that turned out to be even more impressive when a pencil fell down just the moment Rick needed it to make some notes about the case. I really enjoy the interactions between Castle and Beckett now with the whole PI thing Castle has going on. The question is only how long it will take before he gets back working for the Twelfth, as his and Beckett's cases can't always keep crossing each other. But I'm hopeful that we will see at least a couple of more episodes like this, as it seems to do great for their chemistry and friskiness. It is impressive that in the 7th season the writers and actors still manage to show such an evolution in the relationship between our favorite writer and favorite detective. If there was a Moonlighting-curse, Castle and Beckett definitely broke it. What did you think about the episode? 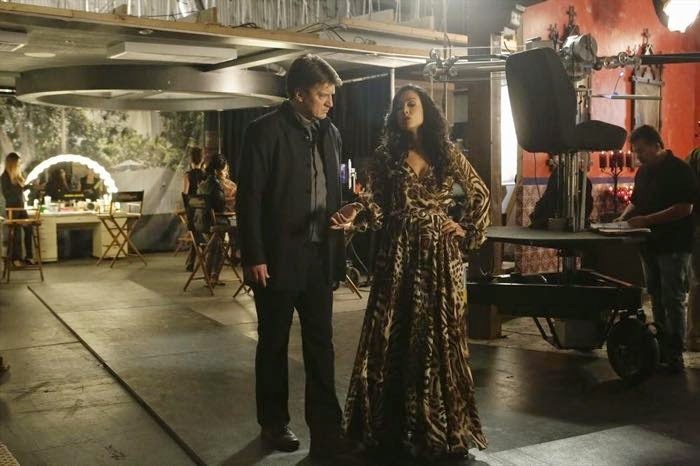 Do you like how Castle and Beckett are acting now around each other? Do you like Perlmutter as much as I do? How long do you think they can span Castle's P.I. adventures? (Will the Derrick Storm TV show be kinda like this?) Or would you rather see Rick back at the Twelfth? Let us know your thoughts on Private Eye, Caramba!